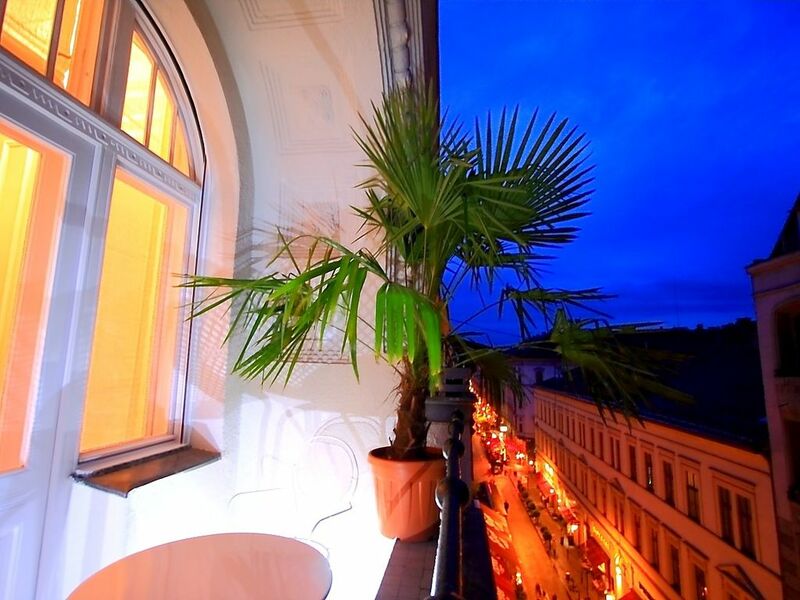 Welcome to Budapest Eclectic Suites. This elegant art nouveau apartment will captivate your senses. Located in one of the most charming street in Budapest, Raday utca, renowned for its stylish restaurants and cafes . the timeless Saarinen table with Verner Panton Vitra chairs, the blue liberty tiles of the balconies/loggia. Relax yourself with the chrome therapy in the two ensuite bathrooms with modern led lighting. 40 sqm living room , Samsung 3D 55' with european channels, Daikin air conditioning, fast Wifi . 3 of us stayed at the Raday. We were met at the airport by Tamas and showed around the apartment by Giovanni. It was all very professional and stress-free. The apartment is high quality and vey well situated in a pedestrian street lined with restaurants. You can walk into the centre of Pest in 5 mins. We really enjoyed our stay and would love to return some day. My husband and I stayed here on a trip to celebrate out 50th anniversary. The apartment was quite large (more room than we needed) and very beautiful. The trip from the airport via a taxi arranged through Massimiliano was very smooth. Giovani showed us the apartment, gave us tips on restaurants, etc. The washer worked well. Highly recomment. We were two couples sharing this beautiful apartment for six nights on a first trip to Budapest. Equipped with everything we needed and very comfortable with good beds, double-paned windows, and a/c. The details of the place: floors, moldings, glass pocket doors are impeccable. Owner Massimiliano very easy to deal with and host Giovanni is a charmer. The location on a restaurant street (but it's not noisy) very near the transport hub at Kelvin Ter suited us perfectly. The building is not as upscale as the apartment but no worries. A last minute booking was a challenge, at a busy time in Budapest, but Massimiliano and Luca combined forces to make things work for us. We had six wonderful days, in an immaculately presented apartment, in a great location, that made our stay even more special. The city is full of fascinating attractions and having a great base from which to enjoy them adds to the pleasure. I've no doubt that all the apartments managed by Massimiliano will be high quality and well managed. I recommend them highly. In a beautiful pedestrian street with dozens of cafes and restaurants. The subway at Kalvin square is at 100 meters, very close to the Big Market and the Gellert thermal baths .